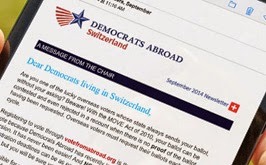 Although Holiday season is upon us, Democrats Abroad is still very active, with many events planned around Switzerland. Plus, we have a very busy fall planned, and we have some initial dates for you to pencil into your calendars now so you won't miss all the fun. Be sure to scroll to the end of this message to find the list of events ! A brand new section went live on www.democratsabroad.org called ''Obama Administration''. The goal of this page is to provide easy access to White House speeches, remarks, press conferences etc... that are relevant to citizens living abroad. You will find transcripts and videos of the various kinds of statements touching on foreign policy matters, nominations of ambassadors and envoys, as well as other key domestic issues, such as Health Insurance Reform and the Economy etc... You will also find President Obama's weekly addresses. Happy Birthday to . . . US! This Fall Democrats Abroad will celebrate our 45th anniversary with events around the world starting October 4th 2009. In Switzerland, we'll have a month of celebrations with events in Vaud, Geneva and Zurich. We will celebrate the important accomplishments of the past 45 years, including those of the last general election where Demoncrats Abroad member votes made the difference in key senatorial and congressional races across the US. Kick off to Mid Term Elections! We have lots of work to do here in Switzerland to get ready for the mid-term election, including membership drives, voter registration, fundraising, and grass roots activities both here and back in the US. So we hope you are ready to volunteer both your time and your financial support to our important work. Mark November 4th in your calendars : We'll celebrate our victory in the elections 1 year ago and the 1 year to 2010 mid-term elections. Kick off parties and meetings will be held that day around Switzerland. If you would like to get involved with either or both of these important committees, please contact Maya Samara at chair@democrats.ch. In a recent poll . . .
Democrats Abroad surveyed its members earlier this summer to get your opinions on what sort of activities and topics are of most interest to you. We want to thank all who replied, as this information will help us plan events that are most relevant to our members. Here is a brief synopsis of our findings. The issues most on the minds of our members (in descending order of importance) are Health Care reform, Energy reform, Climate change, Education, and Tax/Banking issues for Americans living abroad. As an incentive to participate, we offered a random drawing for one of two free Obama t-shirts - winners will be notified by email. Go to www.democrats.ch and click on CALENDAR for more details on each of the events. Thursday 13 August - DA Lugano meet up with Ticino members, Ethnic Lounge, Piazza Maghetti, Lugano, 6pm-8pm. Come meet your DA Excom members, Maya, Michael and Tristan as well as DA Lugano organizer, Lauren !